Totalmix is the most advanced horizontal TMR feed mixer with three parallel screws of Casale. Its anti-compression design permits to operate all types of voluminous food, including prismatic hay bales, with lower power consumption if compared to any other machine from its competitors using the same system (3 or 4 screws). Its transmission system is composed of planetary gear reducer and its lower screw is segmented and provided with shredding knives. 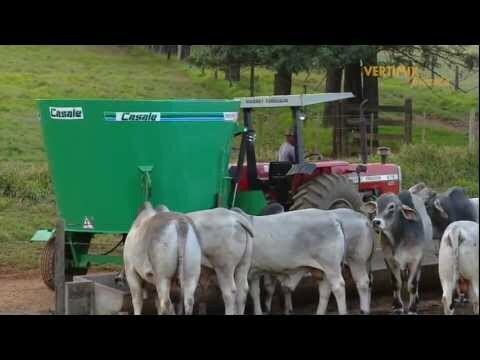 Its mixing system enables homogeneously mix any ingredients for total ration, including lumps of cotton and different types of forage together, as well, whole hay bales that can be thrown in Totalmix to be chopped and mixed. The average mixing time is 5 minutes, ensuring a perfectly homogeneous total ration, which provides a greater production of milk or meat. Unique design anti-compression (patent pending). PVC discharge conveyor belt, driven by hydraulic engine. Electronic indicator for remote weight. Magnetic plates for the discharge spout. Shredding knives for the upper screws. Hydraulic jack for trailed models (standard on model TMX 250). Own hydraulic system (standard on model TMX 250). Hydrostatic transmission (from 17,5m³ truck models).